Jacob Newman's debut album on Earth Mantra was a lush adaptation of the sounds of the FM3 Buddha Machine. 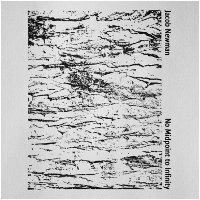 Now, he returns to our humble netlabel with his sophomore release, a collection of solo ambient pieces that show off his prodigous compositional chops, called No Midpoint to Infinity. Most artists have experienced a time when a piece composes itself, when the need to create is urgent and it is all the artist can do just to capture everything that pours out of their hands, without losing anything in the process. Such was the case with this massively deep release. Jacob was playing his Fender P-Bass (the source of all sounds in this album) and suddenly things started falling together, a spontaneous creative process that just happened of its own accord. He had no intent to record an album, but apparently the album decided otherwise. Each track is built up from collections of tones and processes, with layer added to layer until each piece told Jacob they were complete. A very organic and intuitive creative process, resulting in a truly unique and beautiful ambient album. The title partly reflects the mystical nature of the recording sessions for the album, but Jacob wanted moreso "... to lend something to the imagination while listening. The track names were also spontaneous and were simply used to stimulate the imagination. I don't feel these ideas are required to appeciate the sounds; rather, they are there as a complement." The music itself ranges from textural, granular soundscapes to lush slow sweeps of tonal majesty, with occasional flourishes of noise and experimentalism. Always smooth and easy on the ears, however, it nonetheless plays equally well for lovers of abstract ambient and light ambient alike. We are really excited about how well he was able to bring together the disparate worlds of tonality and atonality in his compositions, a singular talent that we hope to hear more of in the future. As Jacob notes, there is indeed no midpoint to infinity, otherwise it wouldn't be infinity. Likewise, there is no midpoint to the depth of the music of this finely tailored album, which really says something. Highly, highly recommended. Played on WVKR Secret Music on June 13, 2010. As an artist, I am always sub-consciously trying to dismantle sound to understand and learn techniques. However I simply can't decipher most of the processes involved with ambient guitar, which is why this kind of music is especially enjoyable for me to listen to. This music is ethereal ambient guitar music, and the outstanding final track "Slow-Wave Dreaming" creates such a feeling of calm and comfort, I can't explain with words. Thank you Jacob for sharing this music with us.